Last week, I promised you the biggest rainbow the world of transport had to offer, so let’s head to the north-east of Madrid, Spain, for a look at Barajas Airport Terminal 4. To this day, I’m amazed that Barajas Terminal 4 and Terminal 5 at Heathrow Airport (London, UK) (my local airport, you see), were designed at nearly the same time by the same architectural practice. 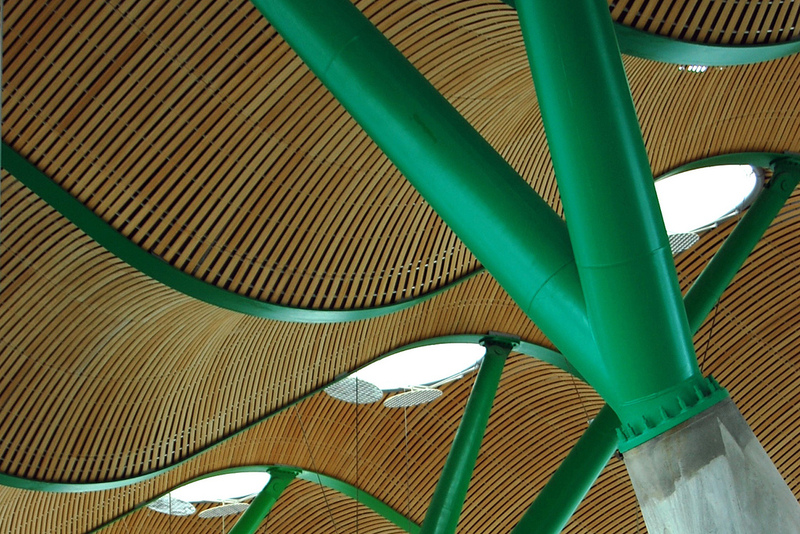 Barajas Terminal 4 is everything Heathrow Terminal 5 ought to be, and isn’t. The former embodies everything that should be good about flying: dramatic, exciting, awe-inspiring, glamorous. The latter (an oversized out-of-town retail park glass-walled shed) embodies everything that is actually wrong with it: soulless, airless, dull, claustrophobic; especially since the wretched terrorists of 9/11 have led to excruciatingly extended security procedures at airports; I feel they’ve won a victory over us every time the queue from a security area snakes around a terminal. Both were overseen by British architect Richard Rogers (1933-), who has become famous for his ‘High-tech’ architecture buildings such as the Centre Georges Pompidou (Paris, France) and the Lloyd’s building (London, UK) . Quite how his Richard Rogers Partnership / Rogers Stirk Harbour + Partners (there was a name change during the process) produced one exceptional airport terminal and a singularly mundane one, almost simultaneously, will forever mystify me, though I suppose Heathrow Terminal 5 must have its fans. 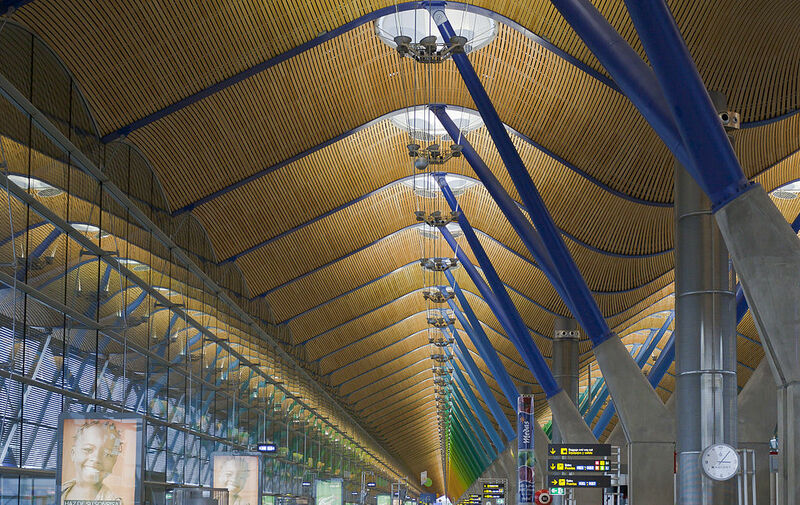 But for my money, Rogers set the standard for airport terminal design at Barajas, and even RIBA (the Royal Institute of British Architects) is on my side in this argument. 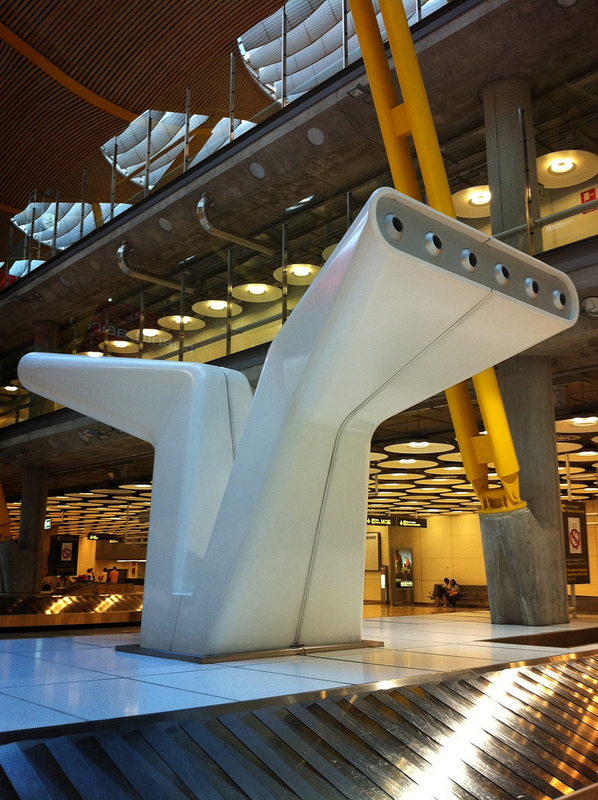 Rogers Stirk Harbour + Partners worked with Estudio Lamela on Barajas Terminal 4, which opened in 2006 (Heathrow Terminal 5 opened in 2008). Classifying its style is difficult because no-one seems to be able to agree on what buildings that look like this should be termed. High-tech is frequently used, but so are Late Modernism and Structural Expressionism. Take your pick. 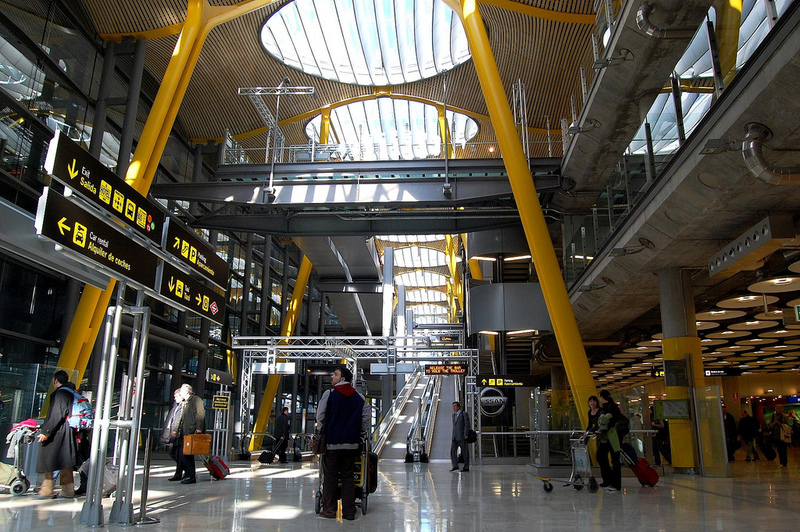 Barajas Terminal 4 is separated into three parallel ranges: check-in, followed by passport control/security and then departures. The three ranges are separated by full-height voids, conceived of as canyons, bringing light from large skylights down into the lower floors of the building. The ‘canyons’ are crossed by bridges, which bring a sense of progression, drama and excitement to the transitions between the different parts of the building. The departures section is much longer than the other two parts, at a mind-boggling 1.2km, with aircraft lining up to the building all the way along the long side, unlike many airports where the terminal is at the centre of several radial piers, with aircraft clustered around the end of each (space-saving but much harder for passengers to navigate). Any of the individual ranges can be extended in future if more space becomes necessary, because of the modular nature of construction. But it’s already a big terminal; there’s a similar 1km-long satellite departures building, a little to the east, linked to the main terminal by an underground people mover. If this all sounds a bit confusing, have a look at the aerial view (linked to in the map at the end of this entry) and it will all make more sense, I promise. 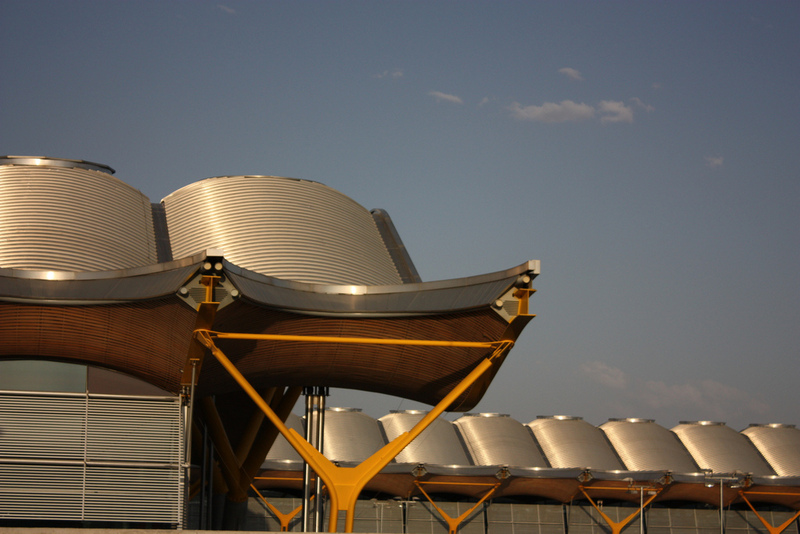 From the outside, the terminal is dominated by its undulating roof. Rogers Stirk Harbor + Partners describes it as the building’s defining architectural element. The roof is even bigger than the building itself, having a fourth range on the west side which shelters the terminal’s drop-off area and main entrance, again separated from the rest of the building by another ‘canyon’. Around the rest of the building, the roof overhangs the actual walls considerably, helping protect the building from the hot Spanish sun. Metal sunshades are hung from the roof, rather than the walls of the building. 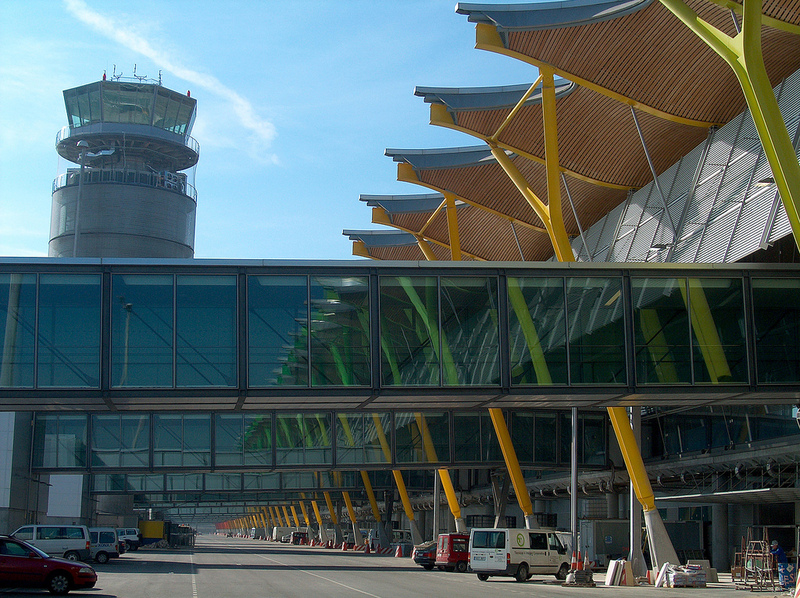 These provide further shade, and further minimise the impact of the terminal’s facade. If you haven’t been to Barajas Terminal 4, but you have been to Rogers’ Senedd Welsh Assembly building in Cardiff, UK, (where giant cedar strips are used rather than bamboo) you’ll recognise the effect. Right from entering the terminal, through to the moment you board your flight, you’re kept company by the curving, organic, ceiling. It’s a constant presence as you move through the building. Thanks to the canyons, even travellers on the lower floors (departures and arrivals are separated vertically) can get a glimpse of it high above. Boarding passes for flights are coloured according to where along the rainbow’s length your aircraft departs from. It’s a subtle and very clever way of assisting navigation in the terminal. Even the underground sections of the terminal have some nice details. The “wok” lights are bespoke, bringing a lightness of touch to the “robustly” (Rogers Stirk Harbour’s term – I think it means tending towards the brutal) constructed concrete lower levels. And then there are the air conditioning vents. If it wasn’t for that massive rainbow, and that extraordinary roof, they’d be the most memorable things about Barajas Terminal 4. Towering up from the ground, rather than hanging down from the ceiling, RIBA describes them as “intentionally expressive air conditioning outlets”, resembling “giant bar code readers”. Well, I suppose they do. But with their swan necks and futuristic appearance, they always remind me more of the heat ray weapons wielded by the Martian craft in the 1953 film The War of the Worlds. 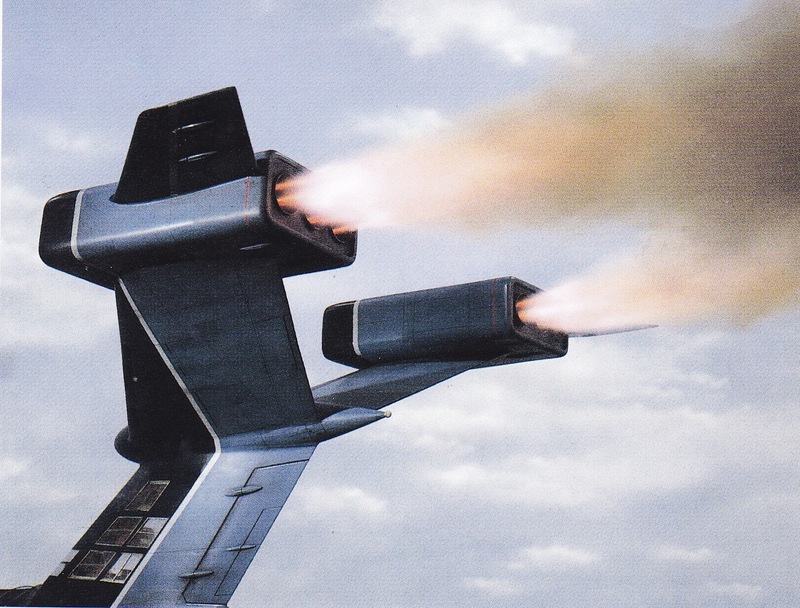 They also bear a striking, and rather apt, resemblance to the tail-mounted engines of the Fireflash supersonic atomic airliner (here) from the 1960s British TV series Thunderbirds (though to be honest I suspect that’s not from where the architects drew their inspiration). Whatever the air conditioning units resemble, they’re a prime example of taking a utilitarian service and making it look beautiful, just because architects can, and should. The comments from RIBA above are from its 2006 Stirling Prize award (open to RIBA chartered architects for buildings in the European Union). 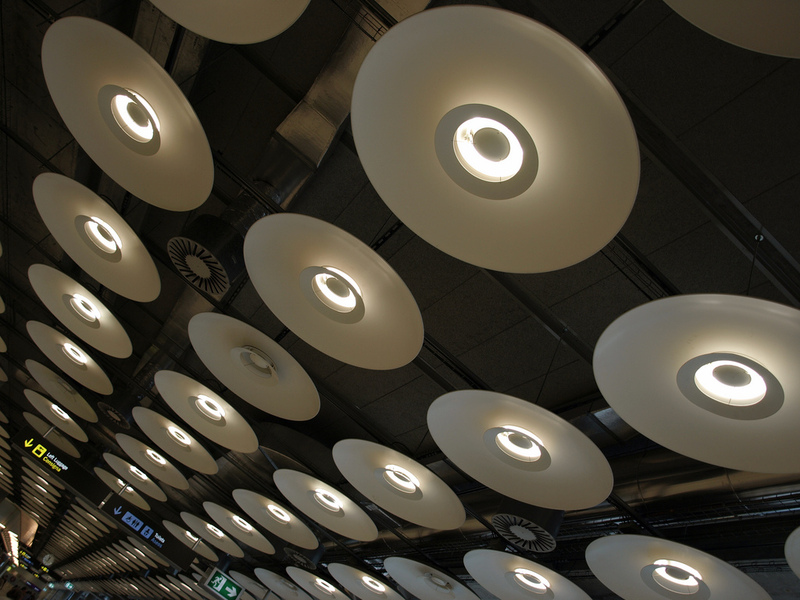 RIBA praised the “clear sequence of spectacular spaces for both departing and arriving passengers,” the “joyful exuberance” of the building, and the “visually clean, remarkably uncluttered and soothing environment,” Barajas Terminal 4 embodies. It’s a building which takes a potentially stressful experience and renders it as calmly as possible. While outside aircraft soar to destinations around the world, inside the souls of its users soar too. In closing, I would merely add that (to the best of my knowledge) Heathrow Terminal 5 has never won a significant architecture prize. RIBA Stirling Prize, 2006: citation here.